Moving Message Display System An EPROM is be used to store the message to be displayed on the LED display. Bits D0 to D6 from the EPROM output correspond to the seven LEDs in one column of the display. A high output turns an LED on, the LED display being a common cathode type. The MSB, D7, is used to reset the system when the end of the message is reached; when it is high the system resets. LEDs are advantageous due to their smaller size and low current consumption. Here is a running message display circuit wherein the letters formed by LED arrangement light up progressively. Once all the letters of the message have been lit up, the circuit gets reset. 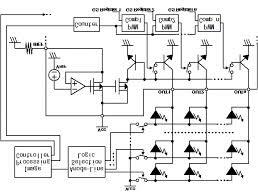 This message display circuit is built around readily available, low cost components. It is easy to fabricate and makes use of 3mm red LEDs. A total of 80 LEDs have been used to display the message “WELCOME”. The LEDMATRIX interface The goal of this LEDMATRIX project was to build a 80x32 pixel display by arranging the displays in two rows with 5 displays each giving a total of 16*16*2*2*5 = 5120 LEDs to be controlled individually. LED Sign with MMC Memory card The principle of operation is simple you have just 160 bits shift register with drivers for LEDs. I removed the old CPU from the LED sign and connected a couple of wires to the shift register (column driver) and the row driver to an ATMega128. The main reason why I chose to use an ATMega128 was the need of a large amount of RAM. I decided to use a MMC memory card to store all the messages for 3 reasons: low cost, SPI interface and a lot of space for messages. The principle of operation is simple you have just 160 bits shift register with drivers for LEDs. I removed the old CPU from the LED sign and connected a couple of wires to the shift register (column driver) and the row driver to an ATMega128. The main reason why I chose to use an ATMega128 was the need of a large amount of RAM. I decided to use a MMC memory card to store all the messages for 3 reasons: low cost, SPI interface and a lot of space for messages. THIS Giant LED Message Display unit provides the following functions: ! Moving message and graphics display ! Static message display ! Animation display It is in modular form and can be built pretty much to what ever size and format one prefers, as discussed later. It is PIC microcontroller controlled, programmable for its displays type and content from a PC computer. The prototype of the display consists of eleven display sections, each consisting of a 5x7 LED matrix. The design allows these modular sections to be added or removed to vary the length of the display required. The research into existing LED displays revealed a number of equally suited products was available, however, the goal of the project was the creation of an original design that could be manufactured into a new product in the future. The display is controlled by a PIC microcontroller that outputs serial data to a series of cascaded serial-in parallel-out shift registers. The shift registers convert the stream of serial data to a parallel sequence used to scan each line of the display.